Artemest is an Italian e-commerce site featuring a collection of curated home décor, jewellery, and lifestyle art created by top Italian artists. The company aims at keeping centuries-old techniques alive. Their mission is to preserve the heritage of the best Italian artisans, who, in many cases, would have shut their business down but for Artemest. Marco Deseri, Chief Digital Officer at Artemest, shared how they help creators survive in the globalised world, where everything is controlled by big corporate brands. Ippolita Rostagno, a New York-based fine jewellery designer, is a successful artist and entrepreneur. She founded her jewellery brand in the U.S. in 1999 and established a strong position on the high-end fashion market. With her artistic background and academic experience, she’s always been fond of genuine artisans with extraordinary skills. Therefore, it was even more disappointing for her to see how Italian creators were struggling to compete with multibillion international brands. When she was travelling back and forth between Italy and the States, she saw a lot of incredible artisans closing their shops down over the years, said Marco. She couldn’t resign herself to their fate. She had her heart set on helping them protect their unique products and heritage. Her idea was to build something to help preserve the incredible skills and craft of these artists and enable them to sell beautiful products to the international audience. Then she met our co-founder Marco Credendino, and they both decided to set up a curated e-commerce platform. Many of the creators that are part of the Artemest network wouldn’t have had the chance to sell their products but for the platform. It’s getting harder and harder for small local vendors to reach potential clients, and they quickly become unprofitable. The founders of Artemest created a space for the artisans, where not only can they sell products to international buyers but also put their name out there and compete with the biggest chains. We’re building an extensive network of independent artisans, makers, and small companies. You won’t find big brands at our website – only the best makers from different regions. We cover the Venetian area with a lot of glass makers, and we have a lot of potters from Tuscany, Sicily, and Veneto. Their expertise has been built and preserved from generation to generation, and we don’t want it to fall into oblivion. 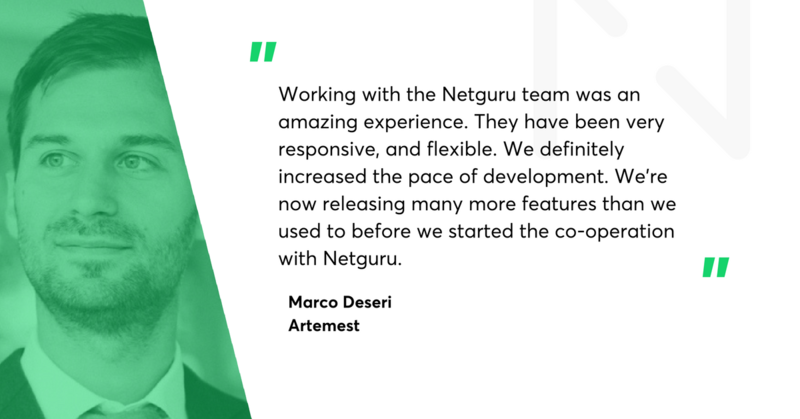 The network has now 350 vendors, who have all been picked by the Artemest team. It’s not like a regular marketplace, where everyone can market their product. We do a strict selection in advance. We verify the vendors, and each and every product must also be approved by a buyer and then by our creative director. The selection process has changed over the last three years. Initially, Ippolita would go to Italy, visit workshop after workshop, meet with artisans, and pick only the best ones. As Artemest had got more attention from other creators and a lot of press coverage, the process reversed. The artisans from all over the country reach out to Artemest to become part of the network. We receive loads of requests to join the platform. We verify these submissions and select the ones who meet the criteria that we set: incredible quality, handmade production process, and Italian origin. We still visit Italy to find exceptional makers and convince them to join the network, but it happens less often than at the beginning. The rapid growth and the rising popularity of the platform create other challenges for the selection process. Artemest aims at maintaining the highest possible quality of products available on the website. They have seen an increasing number of inquiries from smaller artisans, who have not yet established a stable production, or offer only a prototype. It’s a matter of picking the ones whose quality is the same as others’. The goal is to select only those who create top-notch products. We don’t want to bring down the quality of our product range. Quality is our most precious asset, which differentiates us from other websites selling furniture and home decor. Artemest offers mainly furniture, home décor products, and jewellery, but they’re slowly extending their product range to other categories, in an attempt at attracting wider audiences and enthusing them with art. That said, the core vision of their business stays the same: to connect first-class artisans with potential buyers who can appreciate fine arts. Our main category is now furniture, but we also sell a lot of home décor and a broad selection of tabletops. We’re expanding our collection to lifestyle objects such as luggage, boxes, games, bicycles, and even ping-pong tables. The idea is to preserve the same selection criteria, but also to bring more things from other categories to our product range to attract a wider audience – especially before the holiday season. Many of the new products will make perfect gifts. Furniture is not a typical present you buy for Christmas, but with a wide selection of lifestyle items, everyone can find something to give to their loved ones. Finally, the company is getting a lot of attention from young couples, who look for homeware and furniture for the wedding gifts. They offer a wide selection of amazing tabletops that appeal to customers who are about to tie the knot. We spontaneously receive inquiries from couples who want to put decorations on their wedding registry. It is a big opportunity for us to serve that market, so we’d definitely put more resources to grow in this niche. On the supply side, Artemest has over 350 vendors with thousands of products, and the number is still growing. From the demand perspective, they’ve got a big audience to serve. Their customers can generally be divided into two groups: business-to-business clients and individual customers. The first group is mostly made up of interior designers and architects who decorate their clients’ homes. We established a direct relationship with them. We help them serve their customers better with a broad selection of unique pieces that can be customised. Around 75-80% of items that we sell can be personalised. If a client wants a table of a specific size and shape, our artisans can make a sketch and deliver a product that perfectly matches their needs. That’s really appealing to B2B clients. Customisation is available for almost every product on the website. When a client likes a particular product but wants to make some changes, they can write an inquiry and send it to the customer service, who then contact the artisan. They verify whether it’s feasible and what would the best way to do it and come back with an offer. Typically we will send out a sketch to make sure a client is buying something that they like. We are also available on the phone if they need any clarifications. The B2C market is also absorptive. Nowadays, people are more sensitive to art and can appreciate the skills of makers. They can also afford handmade, one-of-a-kind products. They are typically people who have a strong passion for art – people who can understand the product and techniques that are behind that products. Although it was really difficult to convince the artisans that online shopping was a viable business for furniture and other expensive pieces, makers now fight for the right to be part of the platform and sell their products there. Most of Italians are used to smaller transactions online. They shop for clothes or small electronics with no issues. However, when it comes to furniture, people still think that they need to see the product and touch it to make a decision. Therefore, it was really difficult to convince our first vendors that people across the Ocean will appreciate the product and buy it online without viewing it beforehand. The founders had to go an extra mile to get the international attention of the target audience and talk Italian craftsmen into the idea of selling their goods online. Storytelling turned out to be an effective technique. The production team made short videos presenting the workshops of the artisans and their families. One of our co-founders is a Senior Video Producer. He shot one-minute documentaries to tell the stories of the families behind those exceptional products. Typically, our members run a family business that has been going on for many generations, so there is a lot of heritage and charm in their stories. We tried to transfer that charm into our website. The videos really helped. Artemest now represents a substantial part of their business. For many, the platform is the main source of new clients. Some makers would have been forced to close their shops down but for Ippolita, who noticed the problem when travelling across the country. Establishing a relationship and helping the artisans spread the products and passion for art is one of the key elements in Artemest’s business. The makers can offer their products to the international audience and promote their names across the globe. Artemest runs loads of PR activities in the U.S. and in Europe. They join events, reach out to top magazines, and build relationships with American art communities. Artisans are very happy when their products are showcased in popular American magazines. We and our vendors have been featured in New York Times and Architectural Digest. The makers are extremely proud that their crafts are appreciated all over the world. The support doesn’t stop there. Artemest also helps with digital production, promotion, and logistics. They translate all content to English so that vendors can reach out to international customers. They organise all the shipping arrangements, which has been a major challenge for Artemest. The majority of goods available on the website are extremely fragile, of unusual sizes, and thus they are expensive to transport. Artemest interviewed dozens of shipping companies and created packaging guidelines to guarantee flawless transportation. Most of our artisans don’t speak English, and they wouldn’t be able to sell online to a global audience. We also provide customer service and international shipping infrastructure to deliver products to more than 60 countries all over the world. The artisans can focus on what matters the most: the art. The company continues to grow and expand their services to other markets. With an increasing interest from both makers and buyers, we will see more vendors join the network, and the range of items available on the platform will continuously expand. Artemest are preparing for scaling up and adjusting their services to other markets as well. The language barrier is something that hampers reaching out to customers in Europe, so they want to address that problem early next year. We’d like to translate the website into a few different languages to serve other European countries better. We see that most of our business comes from UK, US, Australia, Canada, Hong Kong and Singapore. We want to expand the geographical reach, and this is something that we will aim in the near future. We will also continue expanding our network of artisans and our range. We see that many competitors offer a wider range of products, so one of the key priorities is to get ahead of them. We have roughly four to five new artisans each week, but we also get new products from the vendors who are already on the website. We need to maintain that pace but also provide a reliable infrastructure to serve that growth. Artemest will focus solely on Italian art, at least for now. Italy is filled with exceptional craftsmen who produce unique and top-notch pieces. There is still a lot to cover for us before we go abroad. Working on the domestic market is also more efficient. We’re still a small company, and developing relationships within Italy is easier. We’re still discovering that there are many more incredible makers than we thought initially. But we’ll see what the future brings. Finally, Artemest will invest more resources into their editorial content. The videos and storytelling worked well in promoting the artisans and their products. The company will continue to pick the most unique items and provide meaningful inspiration to customers.